Analytic Drawing is a traditional style of pencil-and-paper drawing where an artist precisely constructs 2D projections of 3D shapes using the rules of perspective. If you have ever done engineering drawing, or things like 2- or 3-point perspective sketches, that was analytic drawing. It turns out that with a bit of interactive UI, we can directly implement the rules of perspective and isometric sketching. 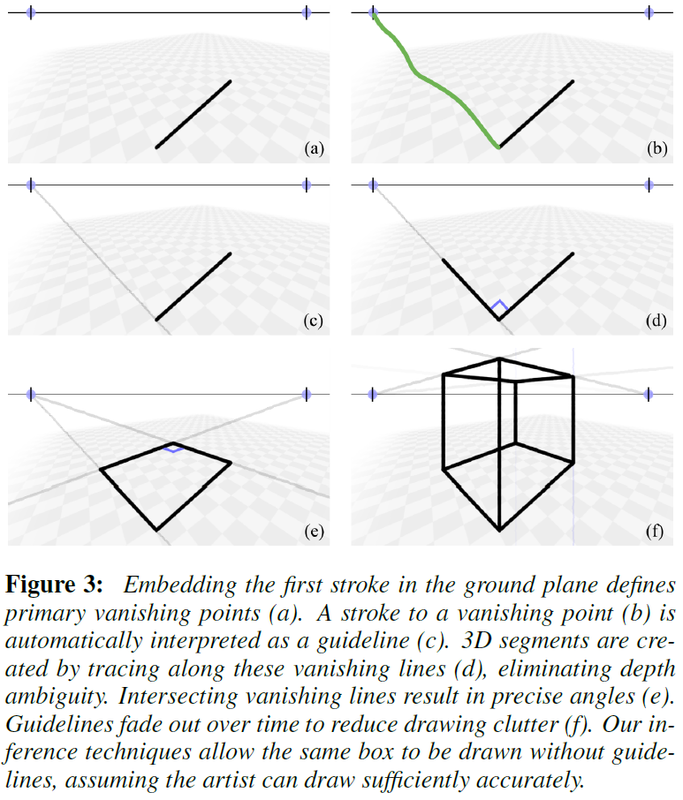 This allows us to precisely infer the 3D meaning of a 2D drawing as it is being created. Since we also have the 3D shape, we can both rotate the view, and provide helpful suggestions to the artist. Although this system was not made publicly available, it was tested by several architects and designers and the feedback was incredibly positive. I presented a paper about this system at SIGGRAPH Asia 2009, click here for the PDF. More details about the project are available here.